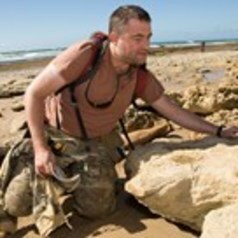 I am a palaeontologist at Museums Victoria studying the evolutionary history of marine mammals - whales, seals and sea cows - and their ocean environment. My work is focused on exploring the fossil record of these mammals, one of the last frontiers for palaeontology in Australia. Prior to joining Museums Victoria’s ongoing staff as Senior Curator of Vertebrate Palaeontology in 2011, I was a Smithsonian Institution Postdoctoral Fellow at the National Museum of Natural History (Washington, DC: 2008–2009), and was the Harold Mitchell Fellow at Museum Victoria (2009–2011). I have a PhD in Earth Science from Monash University. I hold honorary appointments as a Research Associate of the Smithsonian Institution’s National Museum of Natural History, and a Scientific Associate of the Natural History Museum, London.